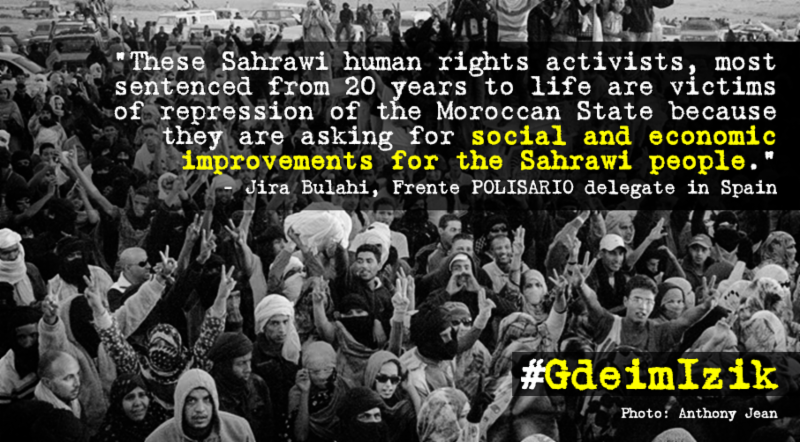 In 2010, thousands of Sahrawis gathered to demonstrate for their political freedom at Gdeim Izik. Moroccan security forces responded by violently dismantling the peaceful protest camps and arresting 23 Sahrawi activists, who received harsh sentences at a 2013 military trial, described by Amnesty International as “grossly unfair.” Now a civilian re-trial has handed down similar sentences – many for life imprisonment – through a judicial process that failed to investigate allegations of torture during interrogation. The Frente POLISARIO has stated that the unjust sentences underline the need for a human rights mechanism to monitor, protest and report on human rights in occupied Western Sahara.